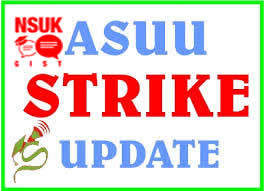 The striking Academic Staff Union of Universities, ASUU, in Nasarawa State University, Keffi, has agreed to suspend the more than 2 months old industrial action if government pays her outstanding salaries and the 20 percent Earned Academic Allowance, EAA. Dr Theophilous Lagi, Chairman of the Union, who briefed NSUK Campus Watch after their Congress meeting today, said both Governing Council and ASUU have agreed in principle to suspend the strike. "We have agreed to suspend the strike, if government fulfills its own part of the deal. "If there can do that today, we are ready to resume work tomorrow ", he assured. In a memo from the Office of the Chairman of Governing Council of NSUK, Bishop Mathew Hassan Kukah, all the contentious six items have been deliberated upon, providing "specifics" as ASUU has always demanded. Government says it will provide two hundred and two million Naira and another fifty million Naira for emolument and capital expenditure respectively. It has also raised the EAA to 20 percent, of which ASUU is demanding immediate payment, along with the three months salary arrears, for the strike to be called off. Governing Council agreed to meet with Appointment and Promotion Committee, after receiving input from ASUU, in order to review the promotion guideline and the 2015 promotion exercise. They also resolved that ASUU should present its input on the draft University Law to Council after which the draft will be forwarded to the Ministry of Justice for further processing within two months. ASUU is also required to present its input to Council on the implementation of the White Paper for final consideration. On the issue of exorbitant tax regime, Council offered to discuss with the Visitor of the University, Governor Tanko Al-almakura, in furtherance of his commitment to set up a committee to review the current tax regime being paid by staff of the University.